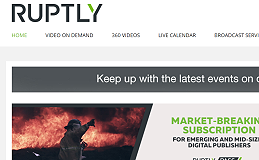 Ruptly launches new video news subscription service. Amsterdam, September 2018: Global video news agency Ruptly has unveiled a market-breaking move to enable access to all content on its Ruptly.tv platform in a new low-cost subscription model. Developed to democratize the video news industry and support emerging and mid-sized digital publishers, Ruptly PASS costs just €12.50 per month and gives users unlimited access to video and live events on the service. 80,000 branded videos are now available on pass.ruptly.tv with the Ruptly Pass subscription. Ruptly publishes an average of 40 new video stories daily, provided by a 3,000-strong network of video journalists from over 100 countries. In addition to video-on-demand, around five live events are streamed each day via the live.ruptly.tv platform. A collection of award-winning 360-degree videos are included in the Ruptly PASS subscription. Ruptly’s pioneering work has recently been recognized by The Drum Online Media Awards for ‘Best B2B News Site’ in 2017, ‘Commercial Team of the Year’ in 2018, and Ruptly LIVE was a finalist of both The Drum Online Media Awards and Global Media Innovator by the UN Diplomatic Council. Since its launch five years ago, the digital video news agency has pioneered new technologies, delivery platforms and content. This includes being the first to deploy a drone over a war zone; delivering real-time drone video; and leading the market with the launch of a live platform that permits subscribers to up-pick as many as nine events at once and stream to various destinations, including 360-degree live coverage direct to social media platforms.